LT in 2015 & The Road to the Beta! Hello there good people of space sim fandom! Merry Christmas and Happy New Year to you all!! :D I hope everyone's had a great holiday season. As we wave goodbye to 2014 and enter into the new year, I'd like to take the opportunity to introduce and explain the (major) shift in LT's dev / update process that I'll be rolling out at the beginning of 2015. In the process, I'll also be explaining the status of the beta and what we're going to do about it. This one's gonna be a rather lengthy bit of text, but I've got a lot to say...so please bear with me! First up, as you all have surely noticed, late 2014 has come and gone with no sign of a beta being released to KS backers. Not good. The simple but honest truth is that the game isn't ready for beta yet. Despite my constant work on it, there remains quite a bit to do (mostly in terms of gameplay implementation) before LT can enter beta. It's not for lack of trying, either. I could get a lot more specific about this failure, but I think the more helpful question to be asking right now is not WHY we don't have a beta yet, but rather, WHAT are we going to do to fix that. Introducing Limit Theory: Road to The Beta! Starting in January 2015, the monthly updates are going to be replaced with a new update series called "Limit Theory: Road to the Beta" (RTB). RTB will be a weekly development digest, comprising text, images, and (optionally) small videos. In terms of medium, it's essentially a blend between the dev logs and the monthly update, taking the best of both worlds. You get some description, you get some visuals, and (sometimes) you get some in-game demonstrations. But, critically, RTB isn't just a change in update granularity. It's a change in focus. With the dev logs and the monthly updates, the focus has always been to show what was done in a given time period. With the new RTB update series, however, the focus of each weekly entry is going to be very simple and very clear: demonstrate to you all, on a weekly basis, that LT has made a significant step toward completion (and beta release). Put differently, whereas the reaction to a devlog / monthly update might have been "yes, this work looks nice," I will strive for the reaction to each RTB entry to be more along the lines of "wow, yes, this makes LT more of a complete, playable game!" Tweaks, graphical enhancements, tech advancements, etc. will not cut it. With the RTB development focus, I will be looking for and pushing to achieve tangible completion of game features and content each week. Despite the fact that the project's timeline is stretching longer than any of us would have liked, I do feel that things are starting to align in a nice way at this point. In particular, it feels like RTB is coming at the perfect time! In the past few months we've undergone the shift to fast, LTSL-based development. Last month, in particular, we saw a wealth of actual 'stuff' being implemented and iterated on in LTSL. Moreover, the tech level of the LT engine is at an all-time high, and, on the whole, more than capable of supporting the beta and 1.0. I wouldn't have been comfortable saying this only a few months ago. But now, I can say with conviction that it's time for the home stretch. It's time to focus all firepower on the deflector shield genera---uhh, I mean, on the completion of Limit Theory the game. Now, returning to the format of RTB, I'll elaborate on the aforementioned "optional small videos." Video content in RTB is going to be handled quite differently from the usual monthly videos. Rather than simply show what was done each week, RTB videos are only going to happen when I have a feature to show off that's best conveyed with in-game demonstration. Hence, these videos are to be small (5-10 minutes), tightly-focused videos that demonstrate the (singular) feature in question -- no more, no less. Again, in keeping with the overarching theme of RTB, the idea is to demonstrate game functionality / content. On top of being a more focused development / update ideology, RTB will also help me to remain mentally-sane by removing the 'update anxiety' that has crept up over the past few months. In RTB, there is no pressure to beat the last entry, no time for last-minute content (since it's weekly), no question of whether the entry is a success or failure. There's simply the need to demonstrate game content, end of story. It's likely that some (hopefully few) entries will indeed be failures in terms of being able to make us say "LT is significantly closer to completion!" But so be it. Such will be the harsh yet efficient nature of the RTB dev process. Game content, and game content alone, is the success metric. In summary, RTB is all about getting LT finished and in your hands. It's about sculpting all the tech and gameplay theory that already exists into a final melange of usable, enjoyable features. Cool, but When is The Beta? Indeed, that's a lot of talk about Road to the Beta, but I'm guessing it hasn't slipped your mind that, amidst said talk, there was nary a date mentioned. What gives? Well, the official release date of the Beta is, as of now, "as soon as humanly possible." What this means is that, if tomorrow I miraculously wake up with 10x as many neurons and am able to implement every remaining facet of LT in a casual 8 hours, then the Beta comes out in two days. Yes, you could rightfully point out that it's an awfully fancy way of saying "when it's done" -- but I hope that you all can see that it's more genuine than that. The truth is, I can't put a date on it with confidence (let's face it, I'm new to this and, thus far, have been pretty awful with dates). But what I CAN do is what RTB promises to do: shift the focus entirely to game completion, and show you that we're moving significantly closer to that unknown date every week. I still do have every intention of hitting early 2015, but, like I said, I'm not going to get more specific about dates. The Road Beginneth on the Fourteenth Day. Hopefully at this point you're all starting to warm up to the idea of some juicy, game-content-focused weekly development imagery, and are asking when exactly this RTB train is going to hit the rails! I've decided that I'm going to take the first week of 2015 to do some final planning, preparation, and mind-focusing. I'll be getting everything ready for the start of this intense (but exciting!) journey toward the completion of LT. As such, the RTB development process and ideology will officially commence on January 7. That puts our first Road to the Beta entry at January 14! Wow. That was really a lot of writing. I do hope I haven't bored you all, but I really wanted to do justice to the reasoning behind RTB, what it means, how it addresses the current lack of beta, etc. In closing, I'd like to invite you all to share your comments, concerns, or suggestions surrounding RTB and the beta plan either in the comments below or the forums. I'm eager to try this puppy out and see how you all like it (and how it speeds up the coming of the beta), but in the mean time, I'll be equally-eager to hear what you think about it! Happy New Year from Limit Theory! That was a lot of dull text, am I right? If you managed to wade through it, you really do deserve a medal. 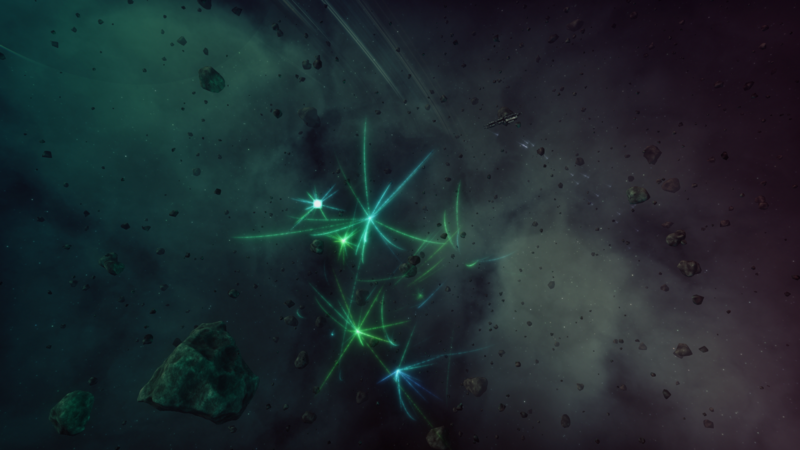 But I don't have medals to send out at the moment, so instead, please accept some festive LT screenshots! Behold: the inhabitants of the Limit Theory universes are currently celebrating the New Year in style after a remarkable research breakthrough in astrofireworks technology! 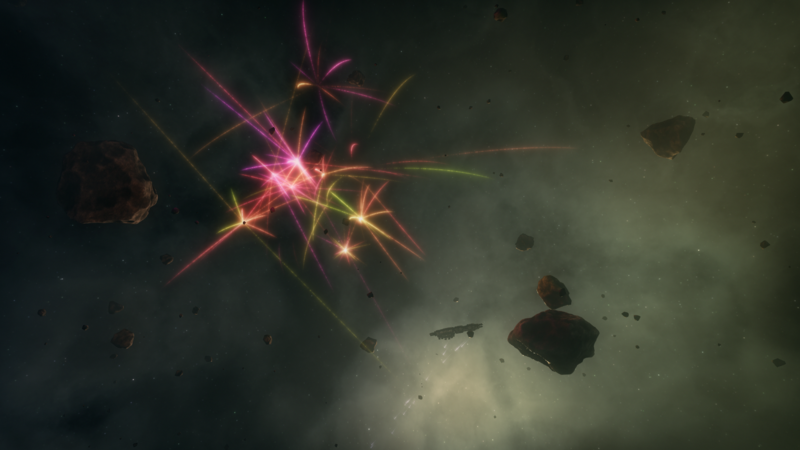 How these colorful, spaceborne fireworks manage to pull themselves downward on a universally-aligned vertical axis remains a baffling mystery to top physicists. Regardless, as one particularly-eloquent researcher put it, "physics be ****ed, they're sparkly and that's all that matters." An 'opportunist' (who refused to be named) also commented that "if you pop two big rounds on either side of a cargo ship, nine times out of ten they'll be too blind to notice a transfer beam cutting through the hull." Delightful! What better way to celebrate the New Year than with a festive bit of thievery! Well, that about does it! See you all on January 14...and until then, see you on the forums :) Happy New Year! tarasis, Matt Hopton, and 52 more people like this update. Nothing like a little pressure to help the vapour finally condense into something solid. ;) Glad to hear it. The sooner it hits beta, the sooner it's ready for you to sell and reap the rewards of your hard work. Josh, your updates alone have been worth the price of admission. I've really pleased to see you focussing on game completion but like many have already said, the timeline is not really a concern for me. I'm excited by what you're producing and happy to wait for it. There has been 0% disappointment with slipping dates. Just a (very, very) small note about "completion" - its a MYTH - software is never complete! Thanks for your work and happy new year Josh!! Great update as usual Josh. QQ: I'm actually not bothered about WHEN (aside from the fact that I'm indeed itching to play), nor the WHAT (as I've every confidence that you'll do what you need to do to get it done), but what I *would* like to know is - what do you feel is missing in order to get beta out? At what point does the line get drawn in the sand on a thing and you say "That's done"? 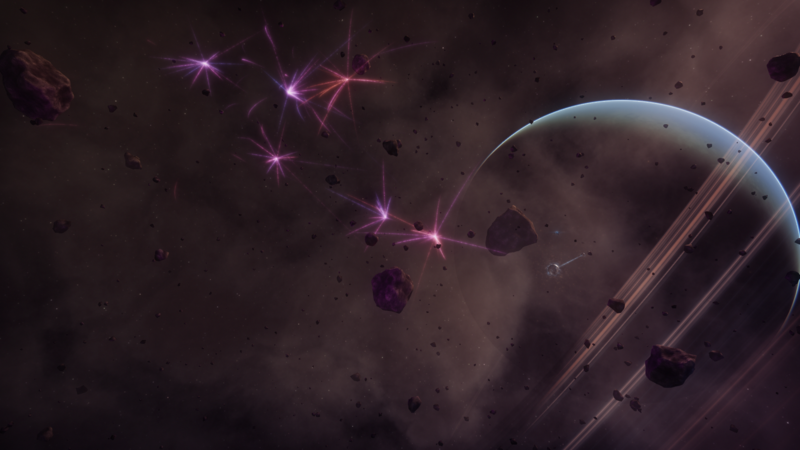 It all feels fairly nebulous at the moment - and that's something I hope will be addressed during RTB. If you say "Mining needs to have feature X, Y and Z, and here is X and Y... Z is forthcoming" then that would be ideal. I'd appreciate that a whole lot more than if you just introduce X & Y and not mention Z as being the completion point. Anyway, great work - and please don't kill yourself or burn out during the sprint. As a dev of 25 years, I've seen it happen all too often. Take care of yourself, first and foremost. First of all, I have been very happy with the monthly updates and the progress made thus far. Updates take time to write, and I am concerned that changing to weekly updates will take up even more time. But if you see it as necessary to keep yourself accountable and to better pace your progress, then give it a go. Still, it might help to review this practice after a month or so, to see if it is achieving its intended effect. What I would really like to see, instead, is your roadmap, to as high a detail as possible: what are the features you still intend to develop before you consider this a beta, and a complete game? In what order will you tackle them? Without such a plan, even with weekly updates, I find it difficult to be convinced that we're moving towards a finish line, because I don't know where that line is. In closing, I am appreciative and supportive of your progress so far, and I hope you find my suggestions useful for your considerations. Looking forward to your next updates! After reading through all the other comments I could not agree more with the support you are getting (you have impressed us all). Following you has been entertaining, and honestly an inspiration. I am also following my own path, and every update from you has really encouraged me to shoot for the stars (he he). From the first time I read your definition of limit theory I knew you were a philosopher I should listen to. I agreed in the limitless possibility of man, but wow have you proven your theory, and your not even done yet! Seriously please do not get down on yourself for any delays. We all know how hard you are working, and how much progress is being made. I'm a fan of TRB if it helps you work, and of course I'll love the day when I can play LT. But I've already gotten my moneys worth. I think most of us here agree, that at this time, there is no need for you to stress over the work you have diligently coded over the past year(s). You have proven you are competent and dedicated. What matters now is not burning out and not creating more work than is necessary. Use your existing design/workflow/change log's to flesh out updates. Cheers! I like the change to a weekly update with simple "this has happened" and "I finished this" kind of information. As much as I liked the monthly video updates (great job there), I saw no benefit in the delays to reach a nearly perfect polished state of LT before recording. I wish you the best for the remaining development time. Me, like other below, say something along the lines of 'it'll be done when it's done' and do not mind if we have to wait for it (look at many AAA games released in an almost unplayable state, sad indeed). Of course I will miss your impressive videos (how did you find time for it all any way? No sleep since this KS ended, eh?) but I rather you have the time, energy and non-burnout to work on the game. Always enjoyed them, though, no doubt about that. Thanks for the update Josh! I sincerely appreciate your openness and honesty regarding your project. To me your doing a fantastic job right as it is. As someone else wrote, just your update videos has made it worth backing you. As a games developer myself I know all the hurdles involved and I am amazed how well you are doing! Your new plan sounds like a great way of removing stress from the development process. I can only parrot the general opinion. Your work so far has been impressiv. If it helps you focus your efforts, then by all means implement RTB. Most important of all, from my POV, I'd like to play a finished game, not an early one. There would be no point in selling a Alpha or Beta as 1.0 Release as many "professional" companies seem to do lately. So take your time to finish and polish a game that people around the globe will want to play and enjoy. As has been said, minor additions to the game can, in theory, be added after the initial release. But if you feel that they simply have to be in the finished game then take the time and tell us about them in the RTB updates. This. I for one want this game "when it's ready" and not a moment earlier. I also want to know the guy who wrote it didn't burn out doing it and wants to create expansions and sequels. I hope you took some time off and had a good break over Xmas/NY. No worries lad. I'd rather play a good finished game than a meh unfinished one. No pressure dude! Well, you're only a year behind schedule. Anyone who expects a kickstarter game anywhere near a promised date is delusional anyway, so it'll come out when it comes out. As always Josh, thank you for the update. I'll miss the LT update videos to be sure, but the RTB focus will be an adventure in itself. You have been just about the most genuine, hard-working & oft humorous fellow and Dev to follow, it's been a real treat. If the game were to never come out then I'd still have had value for money, so good has the experience been with you. With RTB in place, the game will come out and hopefully remove some of the timeline stresses for you. Best of luck in 2015 & thank you again. Are you sure you don't have any medals?? I'll be honest - I'm going to miss those update videos. Every one was a real pleasure to watch, especially the one with the five-minute moment of zen near the beginning. But you're right - Limit Theory isn't a project about update videos - it's about getting a game done, and I think these changes will be a positive refactoring of your workflow (and your mental state!). Just remember that there will come a time in the not too distant future that you will be faced with a choice: add one more feature, or release. And maybe it will be time to release. Limit Theory isn't a project about adding features - it's about getting a game done. Once the game is done, release it, and anything else can be added later. Happy New Year Josh - it's ready when it's ready - we see the progress you make on a regular basis and that's a great thing. Keep on trucking and I look forward to the RTB updates. I remain in the thought that you're one of the best and hardest working people I could have backed on here, I'm sure the stress for releases is inevitable but I just want to pipe in and add that I would much rather have a dev that "Will work till its done" rather than "give what is in hand at this specific date". Not only does it lead to deeper more fun game play it also makes a more solid and worthy product for sale. I'd rather those two things be true than people getting instant gratification and forgetting about it in two months. There are Kickstarter that have missed the timeline and have worried me, a few that have not becuase I trust the repuation or the drive and communication from the creaters inspires trust (you are the second). I beleive your change in ... outlook and goal ... is a good thing. It will lead you where you need to be next. Very little I have done has every felt finished to the best. Voltaire said "The best is the enemy of the good". I think focusing on producing a good beta as opposed to the best game is a good focus. A manager asked a programmer how long it would take him to finish the program on which he was working. "I will be finished tomorrow," the programmer promptly replied. "I think you are being unrealistic," said the manager, "Truthfully, how long will it take?" The programmer thought for a moment. "I have some features that I wish to add. This will take at least two weeks," he finally said. "Even that is too much to expect," insisted the manager, "I will be satisfied if you simply tell me when the program is complete." The programmer agreed to this. Several years later, the manager retired. On the way to his retirement luncheon, he discovered the programmer asleep at his terminal. He had been programming all night. Josh I know you feel bad about not meeting time lines you've made in the past, but your communication and fantastic work more than make up for it. I love how you think and your vision isn't just talk, you've already shown your ability to make them a reality. Take your time and I look forward to a product that meets your high expectations. It feels good to read that you found a way to remove the pressure about those updates but have a focus where to go to. Yes, keep shipping, but also: don't get stressed out. You will make it; no doubt! As some others have said, your progress on LT and consistency in giving us (very entertaining) updates on your progress has been superb. I also think I'd rather have the game (and beta) released with top quality rather than hurried in any fashion. I look forward to seeing more in the coming months! Your doing fantastic work! Thanks for all your efforts. Thank you for all your update efforts (devlogs, monthly updates and now RTB). They raise the bar on what I consider good kickstarter accountability (then again, the kickstarter pitch was mighty impressive to begin with). Changing the subject, I would like to know if there are any plans for how we'll learn LTSL, like documentation, example mod or anything in that regard. I want to finally stop being lazy and start learning some actual modding/gamedev. Anyways, keep up the great work and a happy 2015! Sounds good, but don't feel like you need to rush things, I've been extremely happy with progress so far and would be disappointed if you didn't do things to the same quality just to get the game out sooner. :D :D :D with the plan. And thanks for the awesome festive images. Great plan! Keep it up. I think we all keep watching this space. Have great new year! Sounds like a great plan of attack, more frequency will help you to plan micro goals and be more accountable to yourself without the looming monthly update taking away from your thought processes. Hopefully you can stick the idea that every update doesn't need to be awesome nor "perfect" as I think many of the previous update delays and extra work you did to get them out the door were to do with that mindset that the update needs to be near perfect or it's not good enough. Your RTB plans sound great to me - we've experimented with a load of development processes at my work, and the one that I feel is working best is the one with a fixed, frequent, release schedule. The same amount of work gets done, but it does lead to smaller, neater chunks of work (just because that's what can be fit in!) and as you suggest, having the work go out on a schedule removes a lot of update and moving deadlines stress. 2014 brought a lot to LT - I can't wait to see what changes 2015 brings. I also have this odd suspicion that even after release you'll keep rewriting things, and I can't wait to see the engine and game continue to evolve!